world interior of the year. | owl's house london. world interior of the year. 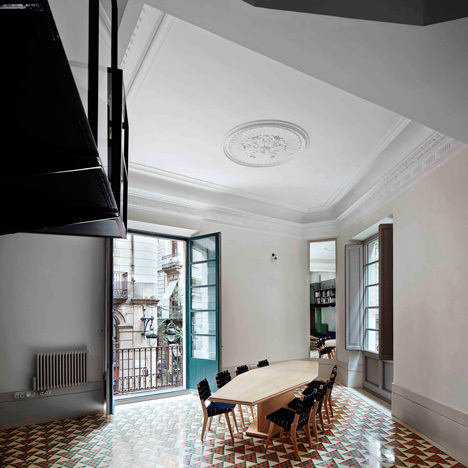 Inside Awards World interior of the Year 2013 is the refurbishment of a piano nobile (or main floor) apartment in the Gothic Quarter of Barcelona. A triangular-shaped site, it is situated at a major crossroads in the city. Stripping back the internal partitions revealed the vertex, reconnecting the apartment with the streets beyond. A look within reveals minimal intervention. The shell of the building and its classical elements are retained. 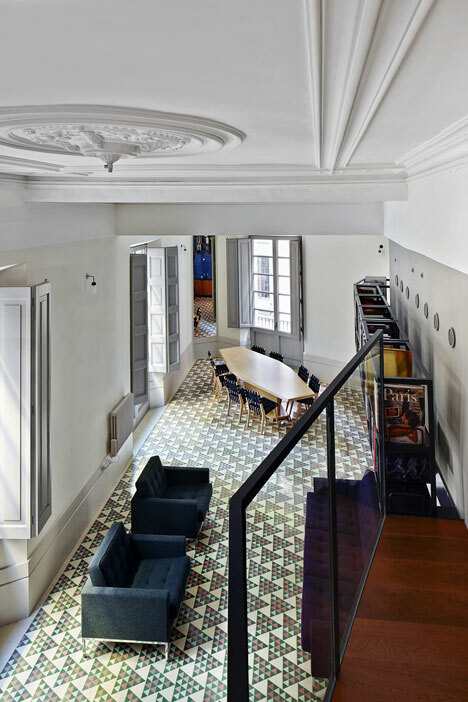 A balcony that connects bedrooms and en-suite bathrooms is lined with books, becoming a high-level library. Simple, rectilinear furniture compliments the simple layout. But the materials palette is an ecelectic mix, unrestrained and rich in colour and materials – gold, black painted metal, dark red wood, cobalt blue tiles, green glass. More than I would ever put together in one space. But I love how the architects have interpreted the brief, thus: the new mosaic floor is decorated with a triangular pattern matching the geometry of the plan. 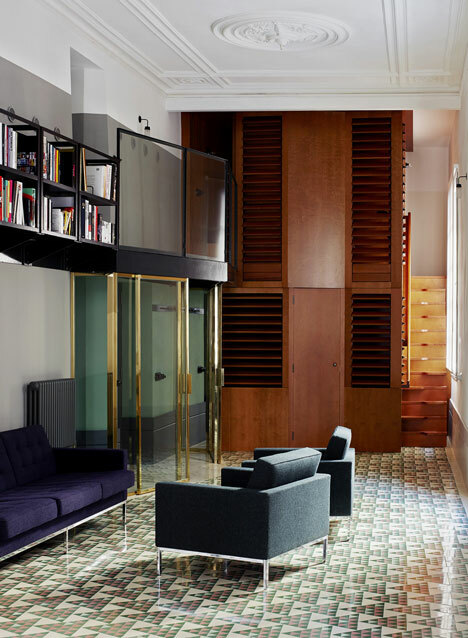 The tile pattern is graded in colour from green at one end of the apartment to red at the other to differentiate the clients’ private spaces – two brothers who share the space as a holiday home. At the street corner the red and green tiles are at their most mixed; this is the dining area which is also the meeting place for family and friends. This entry was posted in happenings., wonderful spaces. and tagged architecture, David Kohn, design, Inside Awards 2013, World Interior of the Year on October 7, 2013 by owls house london.. Such a difficult space to address . Beautifully airy and restrained . yes i like especially how it stays true to its provenance; i can’t imagine that interior anywhere other than Barcelona. I saw the corner on the floor plan and nearly had a heart attack! It wasn’t an easy project, that’s true. Can’t say I am very fond of the mirror or the materials chosen. It seems like too many things on such a small space. What do you think? yes a triangular plan is always going to be tricky! I have had to revisit this interior many times to ‘understand’ it. to me it has a very southern european sensibility; it isn’t a generic interior that could fit anywhere. as i mentioned, i would never put so many colours and finishes in one space! but i think it’s clever in its interpretation of the brief, and very contextual, and perhaps that’s why it has proved successful. great to hear from you, Virginia.